Malayalam blockbuster film is playing in theaters across the US, Canada. 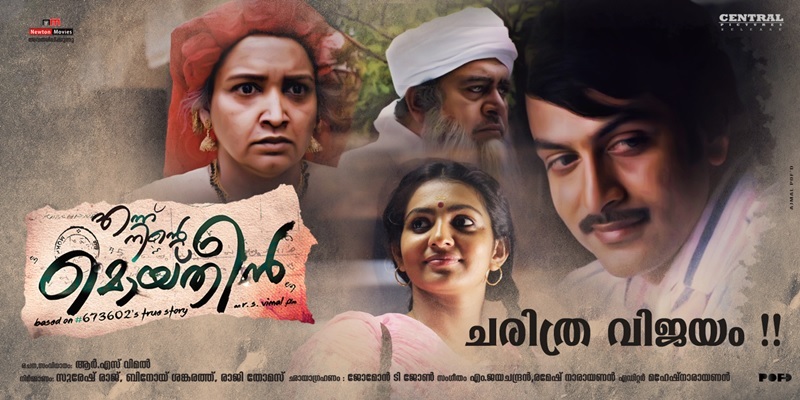 ‘Ennu Ninte Moideen’ is a real life story portraying love, hope, despair and tragedy in the life of two characters from orthodox families – Moideen (Prithviraj Sukumaran), a Muslim boy and Kanchanamala (Parvathy Menon), a Hindu girl, in the backdrop of Calicut (Mukkom) of the 1960s. The powerful story is a far cry from the modern day puppy love stories coming out of Bollywood. Moideen is portrayed as a multifaceted charming footballer, writer and an intense socialist who is against the Congress ideology of his father (Sai Kumar). They are at endless war against each other. While Kanchanamala is shown to be an intelligent and fearless girl who rebels against her Christian hostel management for disparity in the food quality based on economic status. Moideen and Kanchanamala were childhood friends. It is understood that both admire each other from childhood. When Kanchanamala anonymously receives a collection of poems where words expressing love are underlined, which she deciphers, love blossoms between them. The beginning of the movie has some sparkling chemistry between the two. Once the families find out the love between the two, they are aghast and angered despite the long-standing secular thoughts that the families exhibit in society. Inter-faith marriage was a big taboo back then and the chaos begins with the families breaking all links with each other. Kanchanamala is forced to discontinue her studies and put under house arrest while Moideen is thrown out of his home for refusing to marry a girl of his father’s choice. However, strong opposition only strengthen their love for each other. They stay separated for 20 odd years and it was impossible for them to talk, let alone meet. However, in their confinement, they worked out their own encoded language for communication and sent letters via trusted servants. The couple hold on to frail strands of hope for more than two long decades. When they were in their 40’s and Kanchanamala’s siblings had settled down after marriage, they try to elope only to fail each time due to unforeseen circumstances. The couple, however, continue to hold on to frail strands of hope for more than two long decades. Though not a full on entertainment or masala movie, ‘Ennu Ninte Moideen’ raises socially relevant questions, discusses politics and recreates the 60s realistically. Rain, a quintessential aspect of life in Kerala, also plays a crucial role, whether it is at romance, revenge or tragedy, in the film. Prithviraj and Parvathy have given brilliant performances. Sai Kumar (Prithviraj’s father) and Lena (Prithviraj’s mother) are equally powerful in their acts. There are, however, instances, where one questions the authenticity of the grand love portrayed in the film, if such love could really exist. The film also doesn’t flow too well in parts. Regardless of these minor faults, ‘Ennu Ninte Moideen’ joins unforgettable epics of love stories like Romeo and Juliet, Heer Ranjha and Laila Majnu. Kudos to the debutante director and writer RS Vimal for a remarkably crafted film with compelling narrative, breathtaking cinematography by Jomon, showcasing beautiful green backwaters of Kerala and the excellent background score composed by Gopi Sunder. Produced by Suresh Raj, Binoy Shankarath, Ragy Thomas and Dr. Suresh Kumar under the banner Newton Movies, this movie will be here to stay in our hearts “ennum” (forever), for its effervescent one of a kind eternal love. very true love story.i like it.